I'm wondering how many ANAN users have played around with Hermann's (DL3HVH) latest v.0.3.3.0 release of CuSDR64 that came out in Feb of 2017? It doesn't look like there were a lot of visible changes but it does run beautifully and is a treat to look at. I made a brief video of some of the menu forms that are used to set the network parameters and also a few operating settings as well. There really isn't an install program, you simply unzip the contents of the downloaded zip archive into an appropriate folder you make in the Program Files directory where 64-bit programs reside in Windows. A file named "settings.ini" will be created the first time you run CuSDR and that is where you can edit a few things that are not yet hooked into the user interface. As an example, for this video I edited the settings.ini file to set the tuning step for Receiver 0 to 10kHz to accommodate quick tuning across the AM broadcast band. To access the RX-0 controls, right-click on the panadapter and all the controls will appear in an un-docked menu that auto-disappears when your mouse moves off of it, unless you click on "Lock" in the upper right corner of the floating menu. You can also click on the "Radio Ctrl" button in the upper left area of the main user GUI to open up a docked menu area on the right side of the GUI. Note that some users have found that CuSDR does not produce audio through their computer speakers. I never really noticed this since I have always run an audio patch cord from my ANAN's front panel headphone jack to the line-in port of my computer's soundcard. This assures that whatever software I am running with the ANAN will always port the audio to the computer's sound system. This also guarantees that any recording software I use will have the ANAN's audio available to it without using VAC or other interfacing software. If I want to listen to the ANAN with headphones I plug them into the Computer system's Bose Companion Speaker headphone jack. The fidelity is beautiful with this setup and I have yet to find any drawbacks to this configuration. Apologies for the continuous static crashes in the video. We had quite a storm come through the area today! Totally agreed. It's a really nice interface once you have found how to deal with "right click" parameters. The lacks of audio processing is indeed a major problem (unable to demodulate any signal with my Hermes Lite). I hope this feature will be soon added to the project. Pluging a cable between the "audio output" of the hermes and the soundcard of the computer is indeed a very smart idea and could be an efficient temporary solution. I've had a play and indeed its a very good looking interface. I don't know what forms the underlying code for CuSDR, but it always makes me sad to see such fantastic work done outside the context of PowerSDR mRX or Thetis. There is already everything one could want in there, it lacks only a modern UI and a split into client/server pieces to take it to the next level. Indeed, with the re-architecting/refactoring that went on in Thetis, 95% of what is necessary for a radio server now resides in the channelmaster.dll. If all that fantastic effort that is being put into reinventing the entire wheel was put into just the UI imagine what might be. With a little bit of a shell around channelmaster.dll there could be an openHPSDR server app with all of the power of PowerSDR mRX/Thetis. That includes PureSignal, NR2 and squelch (both the best in the business), low latency filtering, you name it. All of the things nobody ever puts into the alternative clients. Move the audio mixing functions to the server side as well so that thin clients only need to receive a single audio stream. Then take that awesome UI work, put a client shell around it and merely have it interface to the channelmaster.dll based server app. Bottom line: keep the fabulous UIs and extend them to control all the functions of channelmaster.dll, keep channelmaster.dll, build the client/server wrappers, move the audio handling into server wrapper. End result: awesomeness! thank You for the hint! Didn't know Herman had released a new version.. It's a beauty! Although i like what i have i wish all the developers could work on this sw to bring it to a final package! But i know that's not possible. These are two different pair of shoes. It's an old saying here in Germany btw. It would be a huge benefit to have a fully outfitted sw for Linux in the future as well. I mean outfitted with everything like PureSignal, and all the great features of WDSP! Rob, You don't have to edit "settings.ini" to change the tuning steps. Just click on the associated digit on the frequency readout to choose the tuning step You like! By clicking twice You even can have a step which is five times the value You click on. Marc, your comments about the convoluted audio path made me laugh. It does seem silly doesn't it? Scott, your comments about the UI made my eyes go wide with all the possibilities. I definitely do understand that at this time the focus is on function rather than form, but at some future date things will reach a point where tinkering begins with the UI. In fact, the recent work Doug has done with the metering in OpenHPSDR is very impressive. I have played around with all kinds of PowerSDR variations and have to admit that the S-Meter in the Genesis (GSDR) version is pretty impressive. You can create your own scale in JPG format with simple photo editing software and stick it into the Console folder to make your own custom meter. This one was made by a friend of mine, Jeff - W2NBC and it's the best I have seen so far. This is one I made for use with a skin that uses a National NC-155 theme. 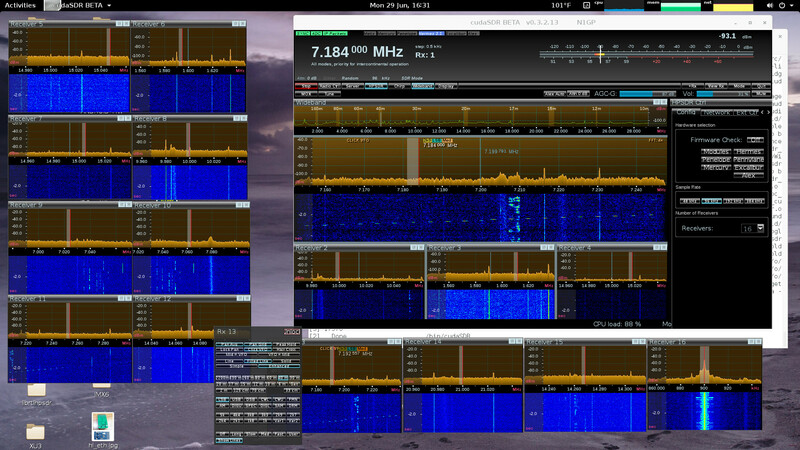 I excluded all the transmit functions because I only use GSDR with the little Fichten Field Day SDR receiver. After the functionality of the software reaches the top shelf (it's getting there pretty fast right now) I would love an interface that allows a lot of user customization. Bernhard! Thank you for that tuning step tip! It works great! I need to click around more!!! Can anyone point me to a working link? As you said, it looks like the download links leading to the compiled versions of the V3 release are no longer good. I'm not sure what the exact status of the CuSDR project is at this time. Guess we will have to hold onto to the hope that V3 will reappear or that it will continue to be developed for a new release. Sorry that I have no information for you. Thanks for the quick reply, seems a shame as the program looks great. That's an impressive demonstration of more multiple receivers than I ever imagined I'd see with one chunk of consumer hardware! I agree very impressive Rick, it really is a great looking interface. I've actually had 20 running, albeit a bit taxing on the Intel I7 CPU. I only added the sound and extra receivers, the impressive interface is all Hermanns (DL3HVH).